Sponsored by Kikkoman and S&B, the UK Sushi Roll Championship returned for a second year at HYPER JAPAN Spring 2012, with five Japanese restaurants in the UK battling it out to win Sushi of the Year. The grand prize was taken by Chef Kok Haw Lee of Tsunami Restaurant with his explosive entry, Dragon Volcano. It was the tasting public who had the final say - after trying a piece of each sushi, tasters voted for their favourite and the winner was announced on the final day of HYPER JAPAN, 26th February 2012. The name 'Dragon Volcano' only hints at the punch that Chef Lee's piece packs. Tobiko, tempura flakes, spring onion and shredded chilli top this explosive number, while king prawn tempura, avocado and cucumber make up the magma beneath. A distinctive and lava-like carrot, onion and mayonnaise sauce is Chef Lee's personal touch, and he flame torches it to achieve a characteristic smoky flavour. Unagi and chilli sauces are then drizzled over the top to complete this year's most explosive entry. Chef Lee originally began his training cooking Malay food, but after ten years decided to switch to what he sees as the most exciting cuisine in the world. In particular he relishes the daily challenge of trying to master a cuisine that looks simple but is in fact intricate and complex. He has been Sous Chef at London's Tsunami now for two years, and here he cleverly combines his knowledge of spicy Malaysian cooking with the refined flavours of Japanese. It is all about fusion for Chef Yamaguchi. Road of Lightening's centre is grilled salmon soaked in a homemade herb soy, complemented by boiled prawns, cream cheese and cucumber. White sesame surrounds the rice, which is topped by avocado and ginger to create a stunning ensemble of colour and flavour. The piece is completed with a personal touch; around the plate goes Nobuyuki's unique blend of cherry balsamic and KIKKOMAN soy sauce, while his homemade vinegared miso and mango chutney is drizzled over the top. The complex pickling process undergone by the salmon in Chef Matsuya's Cherry Blossom betrays his extensive knowledge of ancient sushi technique. The procedure uses rice malt to bring out the flavour of the salmon, which is in turn complemented by the powdered blossom-infused rice around it. The piece is wrapped together by a delicate 'golden thread' of egg, and sits on a sakura leaf designed to enhance its aroma and remind us that spring is (almost) here! 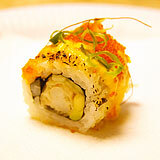 Scottish Salmon 'Crisp' Maki is perhaps the most ingredient-packed piece of this year's line-up. For the filling, specially seared salmon is combined with sea bass and rolled in with asparagus, avocado and tempura flakes. Chef Qiang's skill lies in balancing numerous different ingredients and tastes, and he dapples his entry with a mixture of sake, mirin and KIKKOMAN Soy Sauce, and sprinkles it with spring onion and sesame seeds to achieve this perfect equilibrium of strong and subtle flavours. Chef Nishioka's Very Lucky Strawberry was designed to shake up the Western image of sushi. With its filling of spring strawberries, azuki beans and sakura leaves, there is little doubt that it does just this. Displaying a typically Japanese sense of season, this filling is surrounded by glutinous rice, wrapped in crepe batter and doused in brown sugar syrup, with delicate balls of green tea flavoured milk jelly caviar added to produce the full effect of this dazzling dessert delight.